This article is about the band. For the album, see Bon Iver (album). Bon Iver (/boʊn iːˈvɛər/) is an American indie folk band founded in 2006 by singer-songwriter Justin Vernon. The name "Bon Iver" derives from the French phrase bon hiver (French pronunciation: ​[bɔn‿ivɛːʁ]) ("good winter"), taken from a greeting on Northern Exposure. Vernon released Bon Iver's debut album, For Emma, Forever Ago, independently in July 2007. The majority of that album was recorded while Vernon spent three months isolated in a cabin in northwestern Wisconsin. The band later won in 2012 the Grammy awards for Best New Artist and Best Alternative Music Album for their album Bon Iver, Bon Iver. They released their third album 22, A Million to critical acclaim in 2016. After the breakup of his band DeYarmond Edison, the ending of a relationship, and a bout with mononucleosis hepatitis, Vernon left Raleigh, North Carolina, and moved back to Wisconsin. He spent the oncoming winter months at his father's cabin in Dunn County, Wisconsin. According to Vernon, it was during this time that the "Bon Iver" moniker first entered his mind; while bedridden with mononucleosis, he began watching the 1990s TV series Northern Exposure on DVD. One episode depicts a group of citizens in Alaska, where the show is set, emerging from their homes into the first snowfall of the winter and wishing one another bon hiver (pronounced [bɔn‿ivɛːʁ], French for "good winter"). This was initially transcribed by Vernon as "boniverre"; however, when he learned of its proper French spelling, he elected not to use it, deciding "hiver" reminded him too much of liver, the site of his illness at the time. Vernon did not intend to write or record any music during the time but rather to recuperate from the events of the previous year. Eventually, however, a record began to evolve during this cathartic time of isolation. He had recently finished helping the band The Rosebuds do some recording and had with him some basic recording gear when he made his move to the cabin in late 2006. Vernon played all the instruments during recording and each song was heavily edited with a large number of overdubs. Vernon wrote the lyrics for the album by recording a word-less melody and listening to the recording over and over while writing words according to the sound of the syllables of the melody. In an interview, Vernon said, "Words like 'decision' and 'intention' aren't words that float in my head because I just went." Vernon explains, "I left North Carolina and went up there because I didn't know where else to go and I knew that I wanted to be alone and I knew that I wanted to be where it was cold." In another interview, Vernon describes what he used to record the album: "I had a very light set-up, a basic small recording set-up: a Shure SM57 and an old Silvertone guitar. I had my brother drop off his old drums... some other small things – things I would make or find lying around." The record was almost not released and was originally intended as a group of demos to be sent out to labels and potentially rerecorded. But after getting very encouraging reactions from a number of his friends, Vernon decided to release the songs himself in their present state. According to his manager Kyle Frenette, an initial run of 500 CDs were pressed. The original CD release show took place at the House of Rock in Eau Claire, Wisconsin. Justin played an earlier "all-ages" show and an evening 21+ show to release the original pressing of the album in its card stock CD case. Of the 500 copies issued, 17 were sent to press, mainly blogs. The first significant attention the album received was from My Old Kentucky Blog in June 2007, after which point "it snowballed," according to manager Frenette. Another further breakthrough came when, in October 2007, the album received a very positive review from influential indie internet publication Pitchfork. That exposure in turn led to a performance the same month at the industry showcase festival CMJ Music Marathon. The appearance attracted a lot of label interest and Frenette later told HitQuarters that they subsequently spoke to a lot of different record companies, both independent and major. Out of all of them they decided to sign with the indie Jagjaguwar because their ideals were the closest match to their own. The signing was confirmed on October 29. For Emma, Forever Ago was given an official release by Jagjaguwar. Vernon has said that he will continue to make albums without engineers and producers because he is capable of doing it all himself. Since being released by Jagjaguwar on February 19, 2008, For Emma, Forever Ago has garnered critical acclaim. The album was released in the UK and Europe by iconic indie label 4AD on May 12, 2008. When released in the UK, For Emma, Forever Ago received 5/5 and "Album of the Month" reviews in both Mojo and Uncut magazines. It was the seventh highest rated album of 2008 on review aggregator site Metacritic, with accolades from publications including The Village Voice, The Hartford Courant and The A.V. Club. Pitchfork Media gave the album 29th place in its "The Top 200 Albums of 2000s" list, while Stereogum placed the album at 11 on its "Best Album of the '00s" list. The digital download track "Skinny Love" was selected to be iTunes (UK) single of the week and was available for free during that time, as well as being featured as the track of the day on National Public Radio. Bon Iver was ranked number 8 on Last.fm's most listened to new music of 2008. Bon Iver's For Emma, Forever Ago was ranked number 29 in Rolling Stone's list of the Top 50 Albums of 2008, and was also ranked number 92 on their list of the 100 Best Albums of the 2000s. In an interview, Vernon said: "I'm really humbled by everything and am keeping things in perspective." On May 19, 2008, "Blindsided" and "Flume" were featured in The CW series One Tree Hill. On October 6, 2008, "Skinny Love" was featured in the NBC series Chuck (season 2, episode 3). On December 11, 2008, Bon Iver performed "Skinny Love" on the Late Show with David Letterman. On January 26, 2009, "Skinny Love" was announced at No. 21 by the Australian national radio station Triple J in the annual Hottest 100 countdown of the previous year's best songs. In July 2009, "Skinny Love" was announced at No. 92 in Triple J's Hottest 100 of All Time countdown. Additionally, the track "Flume" has been used by the BBC to advertise their Jimmy McGovern-penned drama series The Street; the track "Blood Bank" (off the EP of the same name) was used in a 2009 episode of the NBC series Chuck (season 2, episode 18) and the track "Creature Fear" was used in another Chuck episode (season 2, episode 21); the track "Skinny Love" was featured in another episode of Chuck (season 2, episode 3), as well as in the ABC drama Grey's Anatomy; "The Wolves (Act I and II)" was used in the first season of The United States of Tara, the film "The Place Beyond the Pines" as well as in the final scenes of the film Rust and Bone ; "Re:Stacks" was featured in the Fox drama House, as was "Flume" on May 16, 2011; "Re:Stacks" was also used for the closing sequence of the Silent Witness episode Death Has No Dominion, and "Woods" was used in the eighth episode of Skins' third series and appeared on the Series 3 soundtrack. In 2008 Bon Iver designed a T-shirt for the Yellow Bird Project, with all profits benefiting the Interval House women's shelter in Toronto, Ontario. In October 2009, Bon Iver first appeared on the cover of the publication The FADER, in its 64th issue. In 2009 Bon Iver, along with St. Vincent, contributed the song "Roslyn" to the New Moon soundtrack. Bon Iver also contributed "Brackett, WI" to the AIDS benefit album Dark Was the Night produced by the Red Hot Organization. In 2010, Bon Iver collaborated with Kanye West on the track Lost In the World, which begins with a sample of the Bon Iver track Woods. Vernon also contributed vocals to the West tracks Monster and Dark Fantasy, both featured on West's album My Beautiful Dark Twisted Fantasy. Then, in March 2011, Justin Vernon performed at SXSW with GOOD Music. This collaboration publicized him to a wider audience. Bon Iver, Bon Iver was released on June 17, 2011. On March 23, 2011, Justin Vernon told Rolling Stone that a follow-up of For Emma, Forever Ago would be released in December 2011. The album is composed of 10 songs and takes a new musical direction: "I brought in a lot of people to change my voice — not my singing voice, but my role as the author of this band, this project," says Vernon, who hired well-known players like bass saxophonist Colin Stetson and pedal-steel guitarist Greg Leisz. "I built the record myself, but I allowed those people to come in and change the scene." The second album is described as an "ambitious musical departure" from the first. Prior to the album's release, Vernon said that each song on the new album represents a place. The song "Perth" was described as a "Civil War-sounding heavy metal song," the song "Minnesota, WI" was described as featuring "finger-picked guitars, double bass drums and distorted bass saxophone," and the closing song "Beth/Rest" would be "horn heavy." The album was recorded in a remodeled veterinarian clinic in Fall Creek, Wisconsin, which was bought by Vernon and his brother in 2008. It was converted into April Base Studios, built mainly over the defunct swimming pool attached to the clinic. Vernon's reason for recording in the location was that "[it's] been a wonderful freedom, working in a place we built. It's also only three miles from the house I grew up in, and just ten minutes from the bar where my parents met." On April 20, Bon Iver announced details of the release through the official Jagjaguwar and 4AD websites. The artwork for the album was also released, painted by the American artist Gregory Euclide. Gregory also released two YouTube videos entitled the Making of Bon Iver Album Art. Over one month before the album release date, the album was accidentally made available for purchase on the iTunes Music Store on May 23. Apple removed the item from the store, but not before a handful of users were able to purchase and download it. There was no comment from Apple, the artist, or his label. However, the lyrics to the album were promptly uploaded to their record site. [We're] winding it down. I look at it like a faucet. I have to turn it off and walk away from it because so much of how that music comes together is subconscious or discovering. There’s so much attention on the band, it can be distracting at times. I really feel the need to walk away from it while I still care about it. And then if I come back to it – if at all – I'll feel better about it and be renewed or something to do that. During the last performance of their 2012 tour in Dublin's The O2, Vernon announced that it was their last performance as a band, "... at least for a while..." At the time, these two events provoked speculation about whether this was a definite end to the band or simply a hiatus. A representative for Bon Iver's label, Jagjaguwar, issued the statement, "They are just going off cycle after two very busy years on this record." Josh Jackson reviewed Bon Iver for Paste, saying, "It retains the beautiful melancholy of For Emma, but in nearly every way, it’s just more. More layered, more diverse, more interesting. He brings in collaborators to do what they do best, but never at the expense of his sound and vision. It treads into new sonic directions without getting lost." He gave the album a score of nine out of ten. In late August 2011, critically acclaimed English post-dubstep musician and singer-songwriter James Blake uploaded a track called "Fall Creek Boys Choir" to his YouTube channel. The track was a collaboration with Bon Iver. It was released as the first single from Blake's EP Enough Thunder and was also included on the deluxe edition of his self-titled debut album. On December 15, 2011, Pitchfork.com awarded Bon Iver, Bon Iver the number one album of 2011. On November 30, 2011, the band earned four nominations for the 54th Grammy Awards: Best New Artist, Best Alternative Music Album for their album Bon Iver, Bon Iver, and both Song of the Year and Record of the Year for Holocene. On February 12, 2012, Bon Iver won the Grammy for Best New Artist. Bon Iver also won the Grammy for Best Alternative Album for Bon Iver, Bon Iver, beating out Radiohead, Death Cab for Cutie, Foster the People and My Morning Jacket. On February 15, 2012, a five-song studio session was released on YouTube, featuring Justin Vernon and Bon Iver drummer Sean Carey performing piano renditions of the tracks. The recording took place at AIR Studio owned Lyndurst Hall in London, England. On November 12, 2012 the band announced its intent to take a break from performing after the last event of its 2012 tour in Dublin. Their label asserted that the band had not broken up. On June 30, 2014, the band released a new song titled Heavenly Father, which was featured on the soundtrack of Zach Braff's film Wish I Was Here. On July 18, 2015, the band played their first show in almost three years at the Eaux Claires Music Festival in Eau Claire, WI where they debuted two new songs, 666 ʇ and 89. Originally both were slated to be in their next album, but only 666 ʇ made it to the record. However, they played 89 occasionally since then, becoming a beloved song from the fans. On November 18, 2015, the band announced a tour of Asia starting early 2016. On July 22, 2016, a 22-second live stream was broadcast on the band's official Facebook page, accompanied by the caption '#22days'. A short clip of previously unreleased music can be heard in the video, accompanied by an updated profile and cover photo. On August 17, 2016, the band announced that their next album's title would be 22, A Million, with a release date of September 30, 2016. They also provided a track list of 10 songs and released lyric videos for two songs: "22 (OVER S∞∞N)" and 10 dEATh bREasT. On August 29, 2016, the band released their lyric video for 33 "GOD", the third single from the album. 22, A Million was indeed released on September 30, 2016. It was noted by many as a large stylistic shift for the band. In Pitchfork's review of the album, the publication likened it to Radiohead's Kid A, saying, "Bon Iver’s first album in five years takes an unexpected turn toward the strange and experimental. But behind the arranged glitches and processed voices are deeply felt songs about uncertainty." 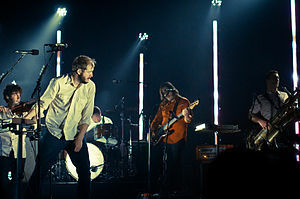 During the summer 2018, Bon Iver began to play new songs in music festivals and the band partnered with Tu Dance for Come Through, a show with a group of contemporary dancers. In late 2018, during an Instagram Live from Justin Vernon's personal account he revealed a folder named "BI LP4" with new songs. Some of them match with the ones played during the summer festivals and Come Through shows. He also revealed a snippet of the song "We Maddie Parry". Recordings were made in Texas in February and March 2019. In live performances, Justin Vernon is joined live by Sean Carey (drums, vocals, piano), Michael Noyce (vocals, baritone guitar, guitar, violin) and Matthew McCaughan (bass, drums, vocals). Noyce was Vernon's guitar student during high school. Vernon uses various keyboard instruments during live performances including synthesisers such as a Dave Smith Instruments Prophet 6, while during studio recordings his instruments have included a Steinway & Sons Model D Concert Grand Piano. Carey approached Vernon during one of the first Bon Iver shows, telling him he could play and sing all the songs. Thereafter, the two played a number of them together. McCaughan and Vernon met while on tour with indie-rock band The Rosebuds in May 2007. Because of the extensive use of vocal harmony on the songs of For Emma, Forever Ago, Vernon was concerned that there would not be enough voices to duplicate the sound of the songs on the album in a live setting. To compensate for this problem in early performances, Vernon passed out lyrics for some songs to the audience to sing along to. In an interview with Pitchfork, Vernon described this dilemma. "I don't want to be the guy with an acoustic guitar singing songs, because that's boring for the most part. The song actually needs 80–500 people singing or whatever the vibe is of that room, it needs that fight." Bon Iver performed at Lollapalooza 2009. Bon Iver has also performed at Austin City Limits Music Festival, Glastonbury, Coachella, Øyafestivalen, Way Out West, Bonnaroo and Sasquatch!, among others. After the release of Bon Iver's sophomore album, the live performances underwent a great deal of change. With older performances consisting of Vernon playing guitar, while Noyce, Carey, and McCaughan varied instruments, the concerts following Bon Iver, Bon Iver involved a much larger, full band. The new lineup consisted of the original four musicians, and included Rob Moose on violin and guitar (Antony and the Johnsons, The National), Mike Lewis on bass (Andrew Bird, Happy Apple), and a horn section including Reginald Pace, Colin Stetson (Tom Waits, Arcade Fire) and C.J. Camerieri (Rufus Wainwright, Sufjan Stevens) as well. On February 2, 2012 Sasquatch! announced Bon Iver as a headliner for their 2012 festival. During Bon Iver's Asia tour in late February to early March 2016 - the first tour since 2012 - the live band still consisted of Vernon, Carey, McCaughan and Lewis, in addition to frequent Vernon collaborator Andrew Fitzpatrick (All Tiny Creatures, Volcano Choir) on guitar, synths and vocals; and sisters Emily, Jessica and Camilla Stavely-Taylor, also known as the folk vocal trio The Staves, whose album If I Was was produced by Vernon. ^ Wickman, Forrest (February 13, 2012). "How do you Pronounce "Bon Iver"?". Slate. Retrieved November 18, 2012. ^ a b c Mason-Campbell, Nilina (May 27, 2008). "Interviews: Bon Iver". Pitchfork Media. Retrieved March 8, 2016. ^ "The Official Site of Music's Biggest Night". GRAMMY.com. Archived from the original on February 1, 2012. Retrieved July 11, 2014. ^ a b c d Wappler, Margaret (February 12, 2012). "Grammys 2012: Bon Iver wins for best new artist". Los Angeles Times. Retrieved February 13, 2012. ^ Judki, Maura (February 13, 2012). "Bon Iver's Best New Artist win confuses Grammy viewers". Washington Post. Retrieved February 13, 2012. ^ a b "Bon Iver: 22, A Million Album Review - Pitchfork". ^ a b Frere, Sasha (January 7, 2009). "Into the Woods". The New Yorker. Retrieved August 29, 2011. ^ "Amble Down Records Bio". Ambledown.com. Retrieved August 29, 2011. ^ a b c Allen, Dustin (February 11, 2008). "Out of the Bungalow: An Interview With Bon Iver". Treblezine.com. Archived from the original on September 27, 2011. Retrieved August 29, 2011. ^ Whibbs, Chris (March 2008). "Bon Iver's Good Winter". Exclaim!. Archived from the original on 2009-10-05. Retrieved 2010-04-12. ^ "Interview: Bon Iver". November 18, 2007. Archived from the original on April 26, 2012. Retrieved February 14, 2012. ^ a b c d e "Interview with Kyle Frenette". HitQuarters. July 25, 2011. Retrieved July 28, 2011. ^ "Bon Iver signs to Jagjaguwar, plays MoB showcase". muzzleofbees.com. October 29, 2007. Retrieved July 28, 2011. ^ "Black Mountain, Bon Iver Kick Off Joint Tour Tonight". Pitchfork Media. February 19, 2008. Archived from the original on 2008-02-27. ^ "Metacritic Music High and Low Scores". Metacritic. May 16, 2008. ^ "Staff Lists: The Top 200 Albums of the 2000s". Pitchfork Media. October 1, 2009. Retrieved August 29, 2011. ^ "Best Album Of The '00s". Stereogum. Retrieved August 29, 2011. ^ "Best of 2008 –". Last.fm. February 11, 2009. Retrieved August 29, 2011. ^ "One Tree Hill Music". Oth-music.com. May 19, 2008. Retrieved August 29, 2011. ^ "Chuck: Season 2, Episode 3 : Chuck Versus the Break-Up (13 October 2008)". IMDb. Retrieved July 11, 2014. ^ "BON IVER: Anywhere From Here". Volume One. December 4, 2009. Archived from the original on June 15, 2009. ^ "Kings of Leon top Triple J's Hottest 100". Courier-Mail. January 25, 2009. Archived from the original on 2009-01-31. ^ "Countdown | Hottest 100 – Of All Time | triple j". Abc.net.au. Retrieved August 29, 2011. ^ "Bon Iver". IMDb.com. Retrieved July 11, 2014. ^ "Skins – Music in episode 8". E4.com. Retrieved August 29, 2011. ^ Solarski, Matthew (December 5, 2008). "BSS, the National, Bon Iver Share Charity T-Shirts". Pitchfork Media. Retrieved August 29, 2011. ^ FADER, The (October 20, 2009). "The FADER Issue 64 Free Download". The FADER. Retrieved November 13, 2013. ^ "Twilight: New Moon Soundtrack Tracklist Finalized at Last". Pitchfork Media. September 21, 2009. ^ Adams, Gregory. "Bon Iver". Exclaim!. Archived from the original on January 15, 2013. Retrieved September 29, 2010. ^ Meatto, Keith (June 9, 2011). "Good Winter, Great Summer – A Review of Bon Iver". Frontier Psychiatrist. Retrieved August 29, 2011. ^ Serpick, Evan (March 23, 2011). "Why Bon Iver Had to Relearn Everything He Knows". Rolling Stone. Retrieved February 13, 2012. ^ Perry, Michael (June 21, 2011). "Bon Iver – Bon Iver". Jagjaguwar. Retrieved August 29, 2011. ^ "BON IVER - Announces Release of Self-Titled Second Album". Archived from the original on April 30, 2011. Retrieved April 24, 2011. ^ Euclide, Gregory. "Foto's van Bon Iver – Profielfoto's". Facebook. Retrieved August 29, 2011. ^ Euclide, Gregory. "Making of Bon Iver Album Art – Part 1". YouTube. Retrieved August 29, 2011. ^ Euclide, Gregory. "Making of Bon Iver Album Art – Part 2". YouTube. Retrieved August 29, 2011. ^ Firebutt, Johnny (May 23, 2011). "Oops! iTunes Leaks Bon Iver's New Album". CraveOnline. Retrieved May 23, 2011. ^ "Bon Iver, Bon Iver: The Lyrics Blog". Jagjaguwar. Archived from the original on July 13, 2012. Retrieved January 3, 2012. ^ "Justin Vernon talks to David Campbell about Eau Claire and the success of Bon Iver" (Interview). Interviewed by David Campbell. Minneapolis-St. Paul: KCMP 89.3. September 23, 2012. Retrieved January 6, 2013. ^ Fitzmaurice, Larry (September 24, 2012). "Justin Vernon: Bon Iver "Winding Down"". Pitchfork Media. Retrieved November 22, 2012. ^ "James Blake & Bon Iver – Fall Creek Boys Choir". YouTube. August 24, 2011. Retrieved January 3, 2012. ^ "The Top 50 Albums of 2011". Pitchfork Media. Retrieved December 17, 2011. ^ Philipps, Amy (November 30, 2011). "Bon Iver Nominated for Four Grammys". Pitchfork Media. Retrieved December 1, 2011. ^ "Adele, Foo Fighters, Bon Iver Win Big at Grammy Awards". NME. Retrieved July 11, 2014. ^ "Justin Vernon says Bon Iver is "winding down"". Abc.net.au. September 25, 2012. Retrieved July 11, 2014. ^ "Hear a New Bon Iver Song, "Heavenly Father"". Pitchfork Media. June 30, 2014. ^ Bartenstein, Ben. "Bon Iver makes triumphant homecoming at Eaux Claires festival". Twincities.com. Pioneer Press. Retrieved July 20, 2015. ^ "Instagram". Instagram. 2016-02-23. Retrieved 2016-09-30. ^ "The Staves on Twitter: "Melmon & Agent Cooper are thrilled to announce that The Staves will be playing IN @boniver on their Asia tour. YES! "". Twitter. 2016-02-08. Retrieved 2016-09-30. Wikimedia Commons has media related to Bon Iver.